Medics have transfused five litres of beer into a man's stomach to prevent him from dying of alcohol poisoning. 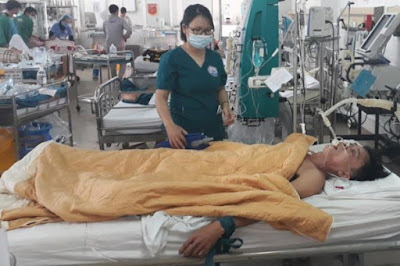 The treatment took place at General Hospital in the central Vietnamese province of Quang Tri when doctors administered 15 cans of beer to 48-year-old Nguyen Van Nhat in order to save his life. Dr. Le Van Lam, head of the hospital's Intensive Care Unit, told local media that the level of methanol in Nhat's blood was 1,119 times higher than the appropriate limit. To save his life, medics had to immediately transfuse three cans (one litre) of beer to slow down his liver's processing of methanol. According to Dr. Lam, one can of beer was given to Nhat every hour and after 15 cans were administered the patient was completely conscious. Dr. Lam explained that alcohol comes in two variants, methanol and ethanol, and the human liver breaks down ethanol first as a priority. The man became unconscious when the methanol in his system oxidised to formaldehyde which in turn produced formic acid, according to reports. Nhat was discharged 3 weeks after the treatment.